Both of these AV receivers have been released in 2018 and come from the same family. That is where the similarities end. RX-V385 has internet radio plus a network audio player not available in RX-V485BL. However, Yamaha RX-V485BL vs Yamaha RX-V385 is a bit more expensive. You can save up to a $150 going for a simpler model. V385 plays a basic humble set of audio formats like MP3, WAV, WMA, and AAC. V485BL has additional Apple Lossless, FLAC and AIFF. 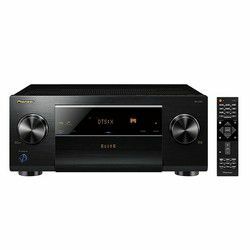 Both of the receivers give an amazing sound with the built-in set of decoders like Dolby digital plus, DTS-HD master audio, Dolby digital plus, and Dolby true HD. These are the same for the two models. Yamaha RX-V385 vs RX-V485BL has a smaller operational power consumption, 380 W versus 400 W. For an environmental freak like me it really matters a lot. RX-V485BL has IEEE, Bluetooth, and Wi-Fi. Compare it to a single Bluetooth connectivity interface in V385. Yamaha RX-V385 vs Yamaha RX-V485BL has a phones input. 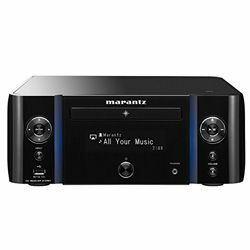 But both have USB, AV, Coaxial, Optical, HDMI and Subwoofer inputs making them both pretty versatile just like all the Yamaha options. They both come with an included remote control designed separately for this model. But only the RX-V485BL comes with a smartphone and tablet remote control app. Both of the AV receivers have an identical style with minimalistic black chrome design. The black rectangular panels have white fluorescent lettering. The weight and dimensions are similar. RX-V485BL weights about 17 pounds and RX-V485BL only 16. First of all, it is affordable which is the main point for many customers. Awesome quality and great premium quality sound, I approve. The setup is very easy and simple. 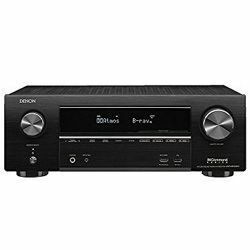 It is way too simple and the options are slightly limited for a modern AV receiver. Some buyers have reported echoing issues. The customer service might be hard to reach and the warranty is limited and complicated. 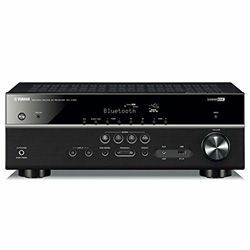 MusicCast multiroom feature available, use this AV receiver for multiple zones. The alignment is very easy and breezy, will take a regular user around 30 mins to set everything up. Some users reported troubles when switching between the inputs but I did not notice any. It is quite pricey, about $400 regular retail price. Also, some customers noticed sudden shutdowns.